This article, by Mark Walsh, is about brands transitioning their ‘fan pages’ to storefronts. The one thing this article doesn’t mention is the Facebook Marketplace. People have always connected on Facebook. Over time, people started connecting to their favorite brands on Facebook. People also started buying, selling and trading things on the Facebook Marketplace. It would have surprised me if these actions did not converge. 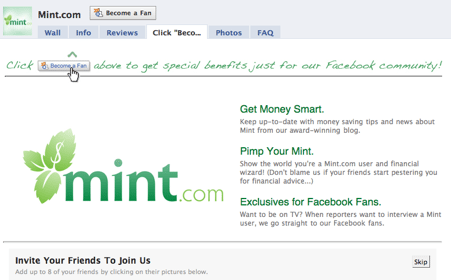 After giving it some thought, I am okay with brands using Facebook as a point of sale. I just hope that those brands don’t lose sight of Facebook’s roots – their first job is to connect with their consumers. Quality interactions with their fans will gain more sales in the end. ‘”What’s often ignored is whether the commercialization of Facebook will hurt its social feel,” said Shiv Singh, vice president and global social media lead at Razorfish. This article compares the top trends for 2009 on Facebook and Twitter. The fact that Lady Gaga didn’t make the Twitter list and Michael Jackson didn’t make the Facebook list is astonishing to me but the article is far more fascinating than the lists of topics. The article reminds me of the difference between Facebook and Twitter. I have said before that Facebook is a place for you to connect with people you actually know. For this reason, on Facebook, the exchange is personal. Simply put, Twitter is an information exchange. Twitter has greater search capabilities and less privacy options [than Facebook] so they have the ability to gather more information. I do not care if you know all of the people you ‘follow’ on Twitter and vice versa. 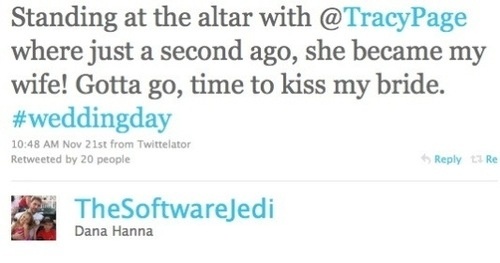 Check out this article, where a man and his wife update their Facebook ‘Relationship Status’ and Twitter Status from the altar. The birthday section on your Facebook ‘homepage’ should be something you check frequently. Facebook has made it far less acceptable to forget, or God forbid completely miss, a birthday. I suggest going to each of your good friends’ Facebook pages and writing their birthdays in your personal calendar at the beginning of every year. There are some friends with whom you are (basically) only in contact via Facebook – those friends are people who you can get away with only ‘wall postings’. You should still send your good friends and family members cards, or see them in person (what a novel thought) to celebrate the occasion. The Facebook ‘wall’, is open for business all year-round. It amuses me when a ‘Wall-to-Wall’ is only birthday wishes. One way to remedy this situation is to personally ‘thank-post’ people who ‘birthday-post’ you. It takes more than a minute to do this but it is worth it. People will be happy or happily surprised that you ‘posted’ them back, nobody will think to themselves, “crap, so and so ‘posted’ on my ‘wall'” if they took the time to ‘birthday-post’ on your ‘wall’. I recently had a birthday, which got me thinking about this topic. I also came across this conversation. For the record, I think it is okay to white lie if you only remembered a person’s birthday because of Facebook…at least you didn’t forget. I would like to dedicate this post to my three Facebook friends with birthdays today: Laura, Craig and Lydia.